my apologies for the silence, I escaped Semana Santa and did an amazing trip to Mexico City and ever since I returned I've been pretty slammed with yoga privates & other work. I've been wanting to write this blog post already for a long while, since this is THE QUESTION I get the most. And as most of you already know, Sayulita is growing very very fast and there are also lots of amazing places to be found on Airbnb or Vrbo. This list is just a selection of my fave places I've hand picked for you to explore as your options for your next trip to Sayulandia. Hotelito Los Sueños (the little hotel of dreams) is located on the north end of town in a more quiet neighborhood. It has recently been remodeled with the addition of a second gorgeous HUGE yoga studio (can fit more than 40 people), a second swimming pool and x number of new rooms. The hotel almost feels like a beautiful garden as they've the walls are beautifully covered with wall climbing vines. They also have a smoothie bar and surfboards and bikes for their guests to use. All rooms have AC. Room rates vary from their Premium room (91 USD/night) to their Villa (178 USD/night). 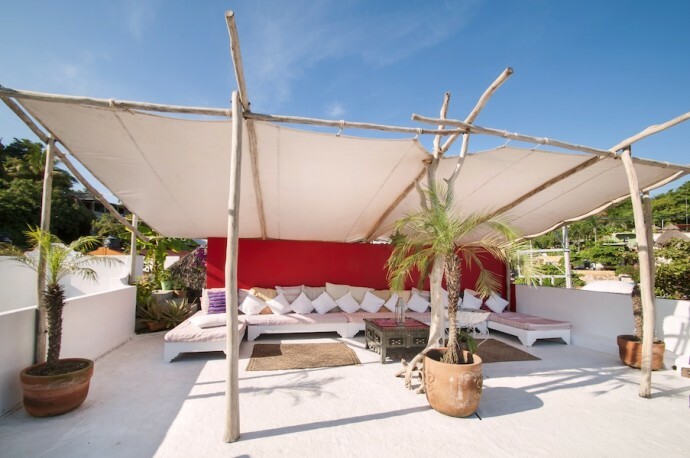 Located next to the surf break, Casa Love this gypset styled boutique hotel is your go to if wanting to stay both close to the beach and town centre. The hotel is upstairs from the famous Pachamama Gallery and has a super cute roof deck to check out the surf. This spot has gotten loads of coverage on social media and rightfully so. There are six rooms to choose from, all uniquely decorated with big mandalas and hearts. There's a big living space with a kitchen and colorful hammocks to lounge in. Room rates vary from 90 USD per night to 190 USD per night. Petit Hotel Hafa is a bohemian Moroccan styled boutique hotel located in town centre just above the famous "Wine Bar" (Le Zoave) and about two blocks from the beach. This family owned hotel has a beautiful roof deck overlooking the town colorfully decorated with vibrant pillows and cactus plants. With 6 different rooms to choose from ranging from 50 USD per night to 85 USD per night, this is the spot if you want to stay in the heart of Sayulita. Amor Boutique Hotel is a luxury hotel located on the south end of the main beach in Sayulita, yet perfectly secluded from the towns hustle and bustle. They offer complimentary daily yoga classes, free use of surf boards and SUP's as well as push bikes. Service on point, great location and stunning oceanfront views with 21 unique villas to choose from. All the villas were built honoring nature leaving big trees growing into some of them (Villa La Paz and Arboles). Room rates starting at 195 USD, if money is not an issue Villa Arboles (850 USD/night) and Villa Romance (850 USD/night) are to die for. Room rates starting at 195 USD/night. All rooms have AC. Definitely the most romantic pick. Aurinko Bungalows is located in the heart of Sayulita, just next to the town plaza. This charming boutique hotel is colorfully decorated with art from local artist and is a family owned business. Last year a wooden yoga studio along with a salt water swimming pool was added to their facilities. This hotel is your green choice as all the water runs through a filter so even the shower water is drinkable! They recently put in a solar panel for them to earn another feather in their cap. Nearly all rooms have AC. Room rates from 90 USD (one bedroom) to 150 USD (two bedroom units). This would be the greenest choice. Situated on the north end of town, Casa Ilusion is a premier beachfront house with four bedrooms. The house features its own private beach with high palm trees situated atop a high seawall giving you privacy from the public beach, however if you were to want to frolick by the waters edge, you can easily walk down to the public beach. Another option would be to nap in on of the big hammocks in between the high palm trees. The house went through a huge remodeling just a few years ago, so the house has a very modern feel to it with its new kitchen and bathrooms. High season rental price 1,357 USD/night and Holiday season (Christmas) 2500 USD/night. Not for the budget traveler ;) but a vacay here will definitely we one to remember. Villa Pelicanos is a luxury oceanview property located just next to Los Muertos Beach. The main house of the property is located on the top of the hill providing a breathtaking scenery overlooking Sayulita and the ocean. There is a huge infinity pool along with a beautifully decorated palapa livingroom. This property is best enjoyed with a large group of friends or family that want to spend quality time together but also some privacy in their own casitas. The house can guest up to 14 people with its 7 bedrooms. There are four separate casitas on the property and each one has its own bathroom. There's also a separate casita for the kitchen and dining area. High season price at 1,900 USD per night. Casa Santander is a beautiful property in downtown Sayulita, just one block away from the beach and town centre. With four different units to choose from, this choice is perfect for the surfer as it's so close to the main surf spot in Sayulita. The property also has a swimming pool overlooking the beach and town. The four units can also be rented in its entirety which makes it a good pick for friends looking to stay together, yet having their own privacy. All rooms have their own kitchens and AC installed. Rates vary from 65 USD a night to 250 USD night depending on size & location. 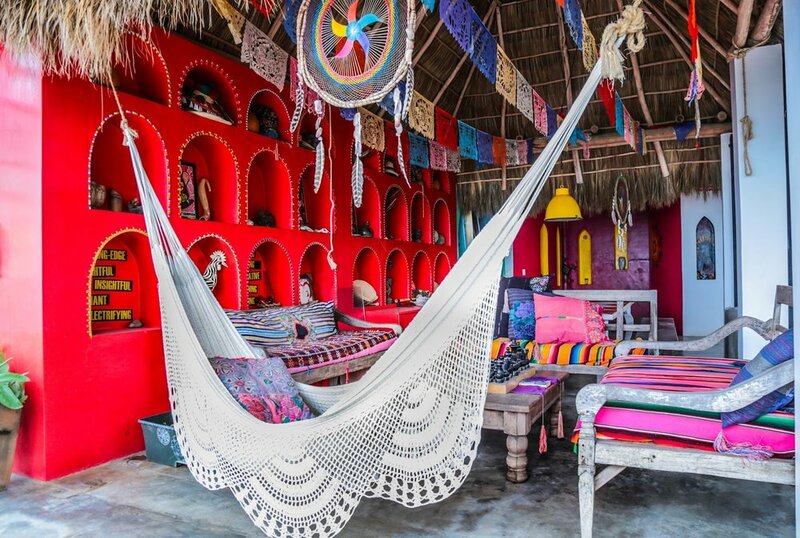 Gifts, souvenirs or home décor, Sayulita has numerous vibrant and stylish boutiques displaying hand-made Mexican crafts and bohemian garments. Make sure to walk down Calle Delfin to find the colorful pompoms, which so often symbolize this lively little beach town. I've listed my top picks here for you to enjoy, if you feel like I forgot an amazing gem: please comment below! This world-renowned gallery, started by the famous Mignot sisters, is a destination in itself. From gorgeous dream catchers to designer dresses and Tahitian pearls, entering this store is must while in town. A bazaar-style shop filled with Mexican and Guatemalan fabrics and trinkets, this is the perfect place to find your souvenirs. Colorful, stylish and vibrant would be the three words to describe this French Mexican shop. With posters and t-shirts of Mexican icons, this is another great option for gifts. High quality t-shirts and clothing for the modern man in bohemian garb. This boutique has an interesting mix of international and national brands and beautiful textiles from young Mexican designers. Vibrant and colorful, Artefakto is a must see in town. When you step into this store, you’re immediately transported to a world of bright, bold colors and beautiful, handcrafted arts, crafts, antiques and home décor items. Most of the collection is sourced from indigenous people in from culturally-rich regions within Mexico. Feminine, delicate and stunning. The namesake designer hand-crafts each piece with antique beads, precious and semi-precious gemstones. This beautiful store feels very zen and it might be challenging to enter without buying something. Yarn-painted skulls made by the local Huichols, hand-woven wool rugs with natural fibers and dyes, and beaded jewelry. What differentiates this shop from the others is the soft earthy tones. This boutique also offers workshops on how to make macramé hangings. Where else can you get that? In the heart of Sayulita, this shop is petite yet filled with great finds. From cover-ups to locally-made bikinis and art, this unique shop should definitely be on your shopping trail when hitting town. Elegant and edgy. Zafiros’ beautiful rings, earrings and necklaces are uniquely made with materials and gemstones from all over the world. This cool little surf shop carries lots of international brands such as Billabong, Roxy, O’Neill and The Seea. If you’re looking to buy a bikini or a pair of flip-flops, this is your go-to. Offers an interesting mix of national fabrics, tie-dye and Indonesian garments. You’ll also find home décor here as well as jewelry and accessories. Hi peeps and my apologies for the radio silence. It's peak high season in Sayulita and I've been busy like never before (not complaining, the opposite actually, I am very grateful). I wanted to share with you what every tourist wants to know when they come to town: where to eat. These are my top picks, if you have any other recommendations, please feel free to share them in the comment section below :). Food is thy medicine and food in my little home town is super delish, yum! Great, fast service and a beautiful ambiance. Some of the tables are on the street if you prefer not to have cars passing by, request an inside table. If you’re lucky, you might even experience a street performance while dining here. Make sure to try their wood fire oven pizzas, my personal fave is the quatro quesos! A small authentic taco place on a busy street. They’ve only got a few tables so keep that in mind. From fish to steak to vegetarian, this is the taco place with the best assortment. My favorite: Quesadilla de Jamaica and tinga de zanahoria, also: the pineapple basil water! Fine dining on the beach. This restaurant is one of the oldest restaurants in town and is known for its great location and fresh seafood. Their menu is a fusion of modern cuisines. Try the catch of the day and enjoy their delicious margaritas. They offer Mediterranean, Mexican and Asian inspired dishes. On Mondays they have salsa nights, even if you don’t dance, it’s very impressive to watch the beautiful dancers gather here. Authentic and absolutely delicious traditional Mexican food. This restaurant is mostly known for their Chile Relleno (stuffed pepper dish) and is therefore also known as the house of Chile Relleno. They also have a very tasty tortilla soup on their menu. The restaurant is partially on the street, but there are two floors. If, you’d like to be seated upstairs, we suggest you make a reservation. A modern Italian restaurant with mouth-watering pastas. Nestled in its own little plaza with very knowledgeable and professional staff, this is a great option if you’re craving something other than tacos. Try their gnocchi, yum! Breakfast, lunch or dinner, this cute place is located just one block from the beach. They have a wide selection of international wines and an interesting fusion of Mexican dishes to Caribbean flavors. Their eggs benedict are amazing, so are their delicious salads.